We are all sellers, in one way or another, both in our work and in our social relationships. We all sell, but we generally do not know how to do it. It is important to learn how to sell, understand the basic concepts and techniques. But why are sales books generally heavy and boring? -A mixture of nonfiction and fiction, with an effective narrative that reveals the hidden truths to sell more and better. -A unique literary experience that provides the keys to excellent sales results. -A book with much humor, to have fun reading. -A must read to beginners in sales, or even for experts who need a refresher. -With the keys to understanding the balance between products, salespersons and customers. -A trip to the past to discover the future, with eternal sales techniques that will always be valid. 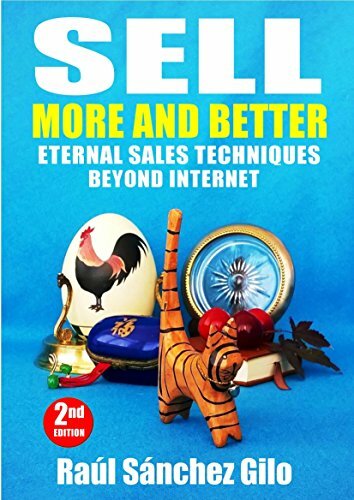 If you sell, or want to sell more and better, this book is for you. Learn in a short time what it takes years to discover. Discover why the value of the tiger is in his eyes! Discover in a more entertaining way how to sell more and better! You don’t need fancy persuasion tactics, a perfect sales pitch or be the best salesman in the world. You need to know the eternal sales techniques that will always work! Hurry up to get your copy! It will change the way you think about selling. You don't need fancy persuasion tactics, a perfect sales pitch or be the best salesman in the world. You need to know the eternal sales techniques that will always work to get more and better clients. Last edited by Raul Sanchez on Sun Apr 16, 2017 2:59 pm, edited 1 time in total. Most people in sales have never read a single book on sales techniques. Or at least that's what I've heard. Thank you, Chris, for this topic, which is very interesting. Personally, I've read quite a few, the classics mainly, and found all of them heavy and boring, regardless of they could be applicable. My new book brings that differential point, a sales book that is neither boring nor heavy and therefore easy to read for those people who - as you say - have not read or do not want to read a sales book. The best approach for this target is with a story, storytelling, and that's what it's all about. About learning how to sell in an entertaining way. In that sense, it is also perfect for sales training. A friend of mine, and also reader of this book, often gives sales classes to sales teams. And after reading my book, his intention is to have his students read it from now on, to save him a lot of time and effort in his classes. I do not have numbers about how many sales books read people in sales (professionals, I mean. If they are amateurs, and have no interest, probably they do not read anyone) - but at any case it is like cookbooks - we are all cooks, and we are all sellers as well! This book will help any reader, whether he be dedicated or not to sell, directly or indirectly, personally or professionally, or belongs to one of the many jobs that in one way or another have a commercial relationship in their daily work. Well, I see in your profile that you are involved in sales as well. Hope to meet you within the book! Last edited by Raul Sanchez on Sat Apr 29, 2017 3:22 am, edited 1 time in total. A trip to the past to discover the future of sales. Last edited by Raul Sanchez on Tue May 02, 2017 3:03 am, edited 1 time in total. Time limited offer from May 19 !! Whether you're new in sales or an expert, it's a quick read that will change the way you think about selling. Anyone in sales will find inspiration and motivation in this unique literary experience that provides the keys to excellent sales results. After the success of the original edition (average 4.8 stars), it is finally available the English version, a must-read sales book for the thousands of salespeople, entrepreneurs, businessmen, marketing and sales professionals, start-ups and students. Discover how to sell more and better with an original book, entertaining, easy and quick to read. Last edited by Raul Sanchez on Thu May 25, 2017 10:47 am, edited 1 time in total. An original combination of fiction and commercial science that teaches the eternal sales techniques to succeed, changing the way you think about selling. Addressed to new in sales and experts of any level. Anyone in sales will find inspiration and motivation in this unique literary experience that provides the keys to excellent sales results. Discover in an entertaining way how to sell more and better with an entertaining book, easy and quick to read. After the success of the original version, now it is available the English edition, a must-read for all type of salespeople, entrepreneurs, businessmen, start-ups, marketing and sales professionals, sales trainers, and sales students. Discover the real value of the tiger, the secrets of the old book and the Samurai's mission. If you sell, or want to sell more of your product and service, this book is for you. Glad to be featured at humanmade.net - A website for readers and authors (both indie and established authors) and books promotion. In Amazon you can also find the paperback edition. Saying this is a sales book is like saying that wine is just a drink. - For anyone looking to increase their sales knowledge. - If you are new to sales or have small experience, this is the first book to read. It will help you to discover the fundamentals of sales and the authentic way to sell more and better. - Recommended also to experienced salespeople and sales managers, especially to those who have taken vices over the years and need to refresh their skills. - For anyone who wants to differentiate from their competitors and get the loyalty of their clients. Last edited by Raul Sanchez on Sun Jan 28, 2018 1:21 pm, edited 2 times in total.